Effect of several vanadium salts, sodium ortho vanadate, vanadyl sulfate and sodium meta vanadate on protein tyrosine phosphorylation and serine/threonine kinases in Chinese hamster ovary (CHO) cells overexpressing a normal human insulin receptor was examined. All the compounds stimulated protein tyrosine phosphorylation of two major proteins with molecular masses of 42 kDa (p42) and 44 kDa (p44). The phosphorylation of p42 and p44 was associated with an activation of mitogen activated protein (MAP) kinase as well as increased protein tyrosine phosphorylation of p42mapk and p44mapk. Vanadium salts also activated the 90 kDa ribosomal s6 kinase (p90rsk) and 70 kDa ribosomal s6 kinase (p70s6k). 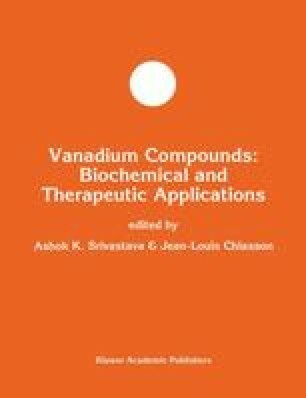 Among the three vanadium salts tested, vanadyl sulfate appeared to be slightly more potent than others in stimulating MAP kinases and p70s6k activity. It is suggested that vanadium-induced activation of MAP kinases and ribosomal s6 kinases may be one of the mechanisms by which insulin like effects of this trace element are mediated.